Couch grass | Infonet Biovision Home. 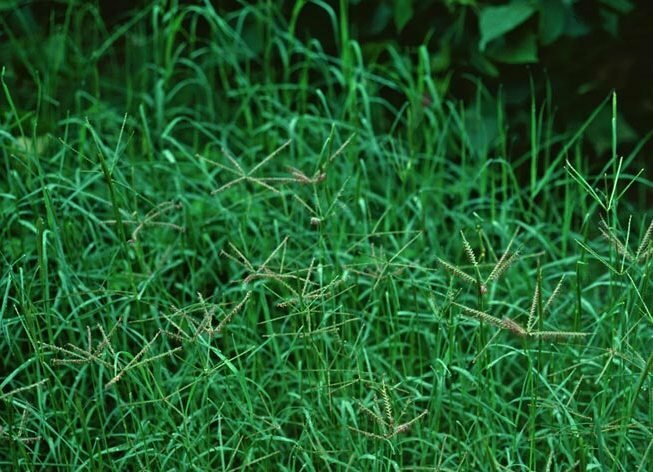 Couch grass (C. dactylon) is thought to have originated in Africa but now occurs worldwide in both tropical and subtropical regions. 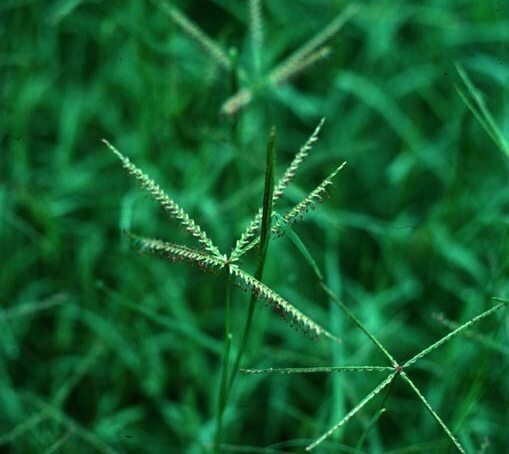 The couch grass (C. dactylon) is treated by Holm et al. (1977) as the second most important weed in the world after Cyperus rotundus, a status that is justified by its occurrence in virtually every tropical and subtropical country and in virtually every crop in those countries. The weed is an alternate host of some plant diseases such as brown spot, leaf spot, early blight, stripe disease of rice, barley yellow dwarf, lucerne dwarf and of nematodes. Couch grass is used as a cover crop to control erosion and for soil stabilization, feed for livestock, lawn beautification and herbal medicine. The stem creeps at full-length along the ground. The leaves are small, linear and blue-green with rough margins. The undersides are smooth but hairy on the upper surfaces. The flowering stalks bear many slender and purplish spikelets. The fruit is reddish-brown or orange-red. The seeds are flattened, oval and straw-coloured. The weed can be spread through seeds, runners, rooting nodes or underground rhizomes. It is mat forming. A single plant can produce up to 720 seeds. It can endure both extensive flooding and drought. The crops in which couch grass is most commonly a major problem are those of the subtropics that are planted in wide rows, for example, cotton, sugarcane, tobacco, citrus, olive, deciduous fruit, forestry and ornamental species and many vegetables, but also some closer-planted but less competitive crops such as rice, lucerne, lucerne and grass pastures, onion and jute. C. dactylon tolerates a wide range of temperatures, especially very high temperatures in near-desert conditions. Freezing point ranges from -2 to -3degC. Growth is favoured by medium-to-heavy, moist, well-drained soils but C. dactylon will also grow on acid and quite highly alkaline soils and the rhizome system can survive flood conditions and drought. Further below you find concrete preventive and curative methods against Couch grass. Legumes or other cover crops are sometimes used for smothering C. dactylon since the weed does not tolerate deep shade. Vigorous crops and higher crop density may be important in reducing weed competition. Traditional techniques of controlling C. dactylon rely very little on manual methods, as it easily survives shallow hoeing and positively thrives on mowing. However, the benefits of deep cultivation have been confirmed in Botswana and Zimbabwe where double ploughing, either after crop harvest or before the onset of the next season's rains, provided a high degree of control and was beneficial to crop yields. The main non-chemical approaches to control couch grass are deep tillage and shading/smothering crops. Holm, L.G. Plucknett, D.L. Pancho, J.V. Herberger, J.P. (1977). The world's worst weeds. Distribution and biology. Honolulu, Hawaii, USA: University Press of Hawaii. ISBN 0-8248-0295-0.